Got swampy soil? Then this is the perfect flowering plant solution for your garden. 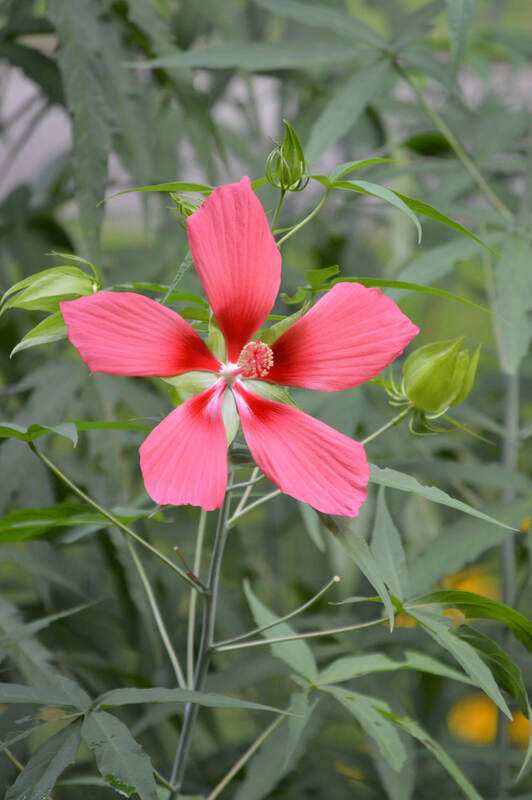 Native to the marshes and swamps of the southeastern states – from Louisiana to North Carolina –swamp mallows (Hibiscus coccineus) actually prefer wet soil and even standing water. I had one spot in my front flowerbeds that none of my favorite plants would grow in – the roots of the plants were just rotting. The soil was pure Mississippi clay, which had been brought to the surface during a construction project. As a result, this area stayed wet for a long time after a rain. I was desperate to figure out what to plant in that spot – did I need to dig out the soil? Amend it? What should I do? Finally, a landscaper friend who knew I was fond of native plants, recommended swamp mallow. I love it – it grows very tall (up to 8 feet) and about 3 feet wide, producing multiple stems from one clump, and has lots of bright red flowers throughout the summer. The only mistake I made was surrounding it by shorter plants. Because it is so tall (mine has grown 6-8 feet) it really sticks out. I plan to add some taller plants around it to make it blend in better. 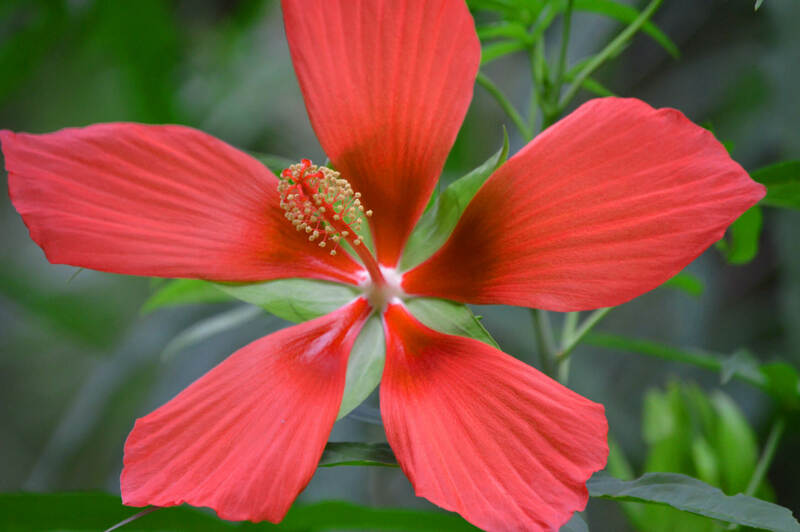 This beauty is also known as scarlet rose mallow or swamp hibiscus. I’ve heard it called marsh mallow before, but maybe that was meant as a pun. It is an herbaceous perennial that is commonly found in swamps, ditches, marshes, and along stream edges. It’s native to the southeastern U.S., blooms in June to September, and grows well in zones 6 to 9. It tolerates the heat of summer and even though it grows very tall (up to 8 feet), I have never had to stake my plants. Even in high winds when other plants bend, the semi-woody stems of this plant stay erect. When planted together in groups of 3 or more, swamp mallows make a striking visual with their height and bright red flowers. Stems can be green to maroon-colored. This one is pretty easy to grow – make sure the soil is moist or wet, and plant it in full sun for best results, but it can tolerate part-sun – then stand back and watch it grow. It’s a fast grower, so pretty soon you’ll have blooms standing as tall as 8 feet. The stems can get pretty thick (up to an inch or almost two) – so you’ll need a lopper to cut them down in early spring. They’re semi-woody, so I don’t put them in my compost pile. You can grow these plants from seed or divide the roots. If you collect the seed, you’ll need to scarify them before planting. Just like other hibiscus I have planted, grasshoppers like to eat the leaves. With the abundance of Eastern lubbers that I have in my yard, the cultivated hibiscus get eaten long before these native ones. But still, it’s something to keep in mind.